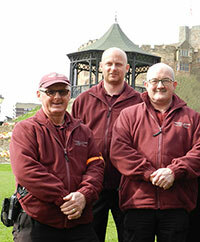 Tamworth Community Wardens - previously known as Street Wardens - have been patrolling our streets since 2002 and aim to help the borough become a cleaner, greener and safer place to live. Easily recognisable by their burgundy uniform, they are here to help; everyone should feel they can approach them for help and advice. There are currently five wardens who patrol the whole borough. To contact the wardens either approach one of them, or contact the Warden Enquiry Number on: 01827 709709. The wardens operate from Monday to Saturday. They are not substitutes for the police and do not have powers of arrest. However, they can issue fixed penalty notices for various environmental crime and dog related issues such as littering and dog fouling. Wardens provide a link between the local communities, other organisations and the police. Patrols are carried out on foot, bikes, via buses and a community warden car. You can help the wardens by reporting concerns over community safety, cases of anti-social behaviour and by coming up with ideas to improve your local environment. You can also report any issues of littering or dog fouling to your community wardens with as much detail as possible. Alternatively you can Report It Online. Our community wardens provide support for the local community and are also part of Tamworth's Community Safety Partnership. They work closely with partner organisations such as the police and the anti-social behaviour team, Fire Service, Tamworth Borough Council Housing teams, housing associations in Tamworth, Town Safe, Neighbourhood Watch and the NHS. Bullying, litter, anti-social behaviour, internet safety and stranger awareness.